Local governments are mandated by the state of South Carolina to reduce landfill waste disposal. Your company or organization can play a vital role in helping to extend the life of our landfills, conserve our natural resources and ensure a healthy environment for future generations. Charleston County's Business Recycling Program offers recycling service supported by the County's Solid Waste User Fee. Many businesses are located along our existing curbside service routes and can sign up to participate by contacting Charleston County Environmental Management. Staff can help your business determine the best way to recycle based on your needs. To start recycling at your business, please contact Environmental Management at (843) 720-7111. Staff is available to conduct an on-site waste assessment, answer questions, make recommendations and provide educational materials. Alternatively, another option is to contact your MSW waste hauler to inquire if they provide recycling collection. Additionally, Charleston County's Commercial Food Waste Composting Program gives local businesses the opportunity to reduce their overall disposal costs and impact on the environment by contracting for collection and negotiating fees with partnered haulers to divert this material from the waste stream to Charleston County's Bees Ferry Compost Facility. Click here for more information. Your business can reduce the user fee charged by Charleston County's Revenue Collections Department by participating in the County's Commercial Recycling Program. Revenue Collections currently charges businesses $172 per cubic yard of garbage service. For example, an 8-cubic-yard garbage dumpster at a business serviced once per week has a user fee charge of $1,376 per year. Reducing the size of the container by taking advantage of Charleston County's Commercial Recycling and Food Waste Composting programs could reduce the amount of the business's user fee bill. Reducing the dumpster by 2 cubic yards to a 6-cubic-yard dumpster and by diverting recyclables and food waste could save a business $344 in yearly user fee charges (less any food waste collection costs). Recycling is not only good for the environment; it's good for your business's bottom line. How Does A Business Recycle Electronics & Hazardous Materials? 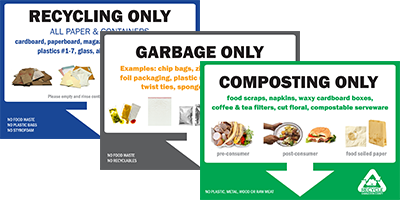 The Charleston County Environmental Management Department cannot accept electronics and hazardous materials from businesses because the recycling program is mandated for residential properties only. Businesses can call private hauling companies that recycle electronics and/or hazardous materials to help recycle electronics in bulk. Call the Environmental Management Department at (843)720-7111 for more information. For information on how to recycle items not accepted in Charleston County's Business Recycling Program, such as corks or wooden pallets, please visit DHEC's Green Resource Index. How Does A Business Dispose Of Construction & Demolition Materials? The Charleston County Environmental Management Department cannot accept construction materials from businesses. There are a number of C & D Recycling and landfill locations in the area available for businesses to drop off these materials. Call the location in advance to find out if there are any stipulations. The County provides business recycling collection once a week. 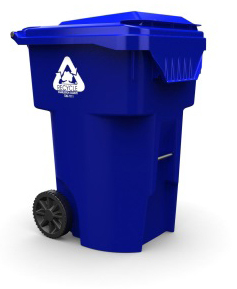 If you are currently receiving recycling service through Charleston County, please click here to view a collection schedule. If you would like to inquire about receiving recycling service, please call (843)720-7111. Allows you to advertise your green efforts to customers! Waste generated from commercial businesses accounts for more than 60% of the total municipal solid waste in Charleston County. A recent waste audit showed that approximately 70% of commercial solid waste in Charleston County is recyclable material, predominantly paper. Each person in South Carolina throws away about 4.5 pounds of trash per day, most of which goes to solid waste landfills. Recycling at your commercial business allows you to do your part to support Charleston County Council's 40% countywide recycling goal. Fisher Recycling is Charleston County’s preferred provider for glass collection. For more information, visit www.fisherrecycling.com or call (843) 554-6099. The S.C. Department of Health and Environmental Control would like to know about businesses that recycle. The S.C. Department of Health and Environmental Control's online reporting system, Re-TRAC Connect, is a free, confidential service that allows organizations to submit recycling data to the agency in an effort to accurately measure the amount of material being recycled. Click here for more information about the state's Re-TRAC Connect program.